Carmen and I chose to eat lunch at the Crenshaw location of Tacos El Unico, another Los Angeles minichain of taco restaurants, currently ten locations strong according to their website. The most conspicuous location might be the one at Adams and Vermont near USC. 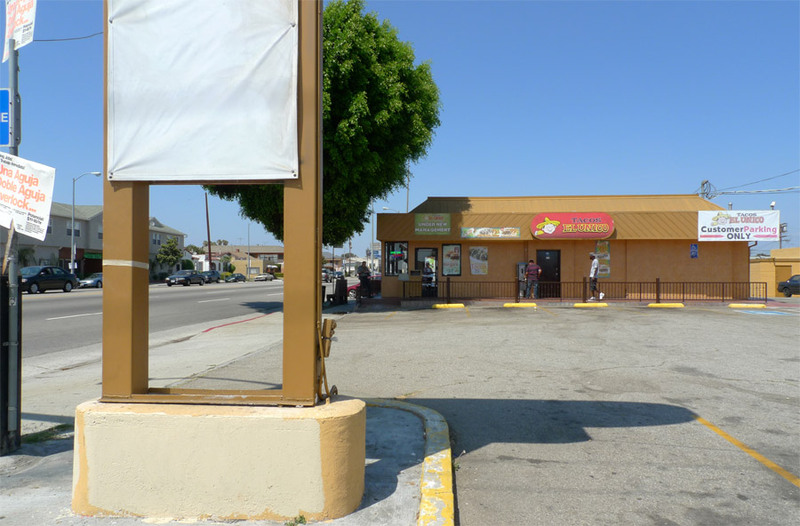 The website explains that the chain is an outgrowth of a taco truck business that started back in 1981 at the corner of Rosecrans and Atlantic in Compton where they subsequently built their first restaurant. It’s another story of the American Dream coming true. We found decent tacos there, the kind you would eat regularly if you were in the neighborhood, but not worth driving across town for. We each had the $4.99 combo special of four tacos and a fountain drink (individual tacos, average in size, are a bargain at $1.16 each), and shared some tasty fresh French fries. I took the tour, having one each of the carne asada, al pastor, chicken and lengua tacos. I refrained from trying the cabeza. The tiny public section of the restaurant interior has a few stainless steel tables and a counter. Ordering is alienating, taking place through steel security bars in an opening in the bulletproof glass, which did not make me feel protected, but did prevent me from pulling any stickup jobs while at Tacos El Unico. We got lucky and were awarded a table halfway through our meal, not that there is anything so ghastly about eating over a stainless steel counter while standing next to a trash can. For the record, if I lived in a loft apartment, I would have no kitchen other than a decommissioned taco truck and no table other than the stainless steel counter extended from the truck’s passenger side. And also I would sleep on a mattress in the back of a conversion van. The tacos were totally serviceable. The tortillas were bilam’d (Carmen received a freak-of-nature taco even that was triply laminated!) and sturdy. Chicken and lengua came con todo with green salsa, and al pastor and steak with red, which consideration I appreciated. I started with chicken, which was pretty tasty – well marinated dark meat, somewhat like slimy Del Taco chicken, but tasty. I moved on to lengua – gamy cuboid chunks of beef with a good texture. Not bad, but I still haven’t been wowed by any of the lengua I have tried this year. Next I ate the al pastor, savory flavored and of the saucy variety. I thought it was okay. Carmen liked it so little she gave me her second al pastor taco, which for me was a great bonus worthy of Special Day celebration. Finally I ate the steak taco, sadly the smallest of my tacos, for Carmen and I agreed that it was the best. The steak was in fairly large strips and marinated with carne asada seasonings – it reminded me of the carne asada steaks that we sometimes get at Bodega R-Ranch Market #14 supermarket for home grilling. Flap meat, maybe? It has a rewarding chewy resistance to the tooth. The red salsa is good and pretty spicy, rounding out this taco nicely.